The Cardinals have lost eight of their last nine games against the 49ers, including a 32-20 defeat in San Francisco in October, but have won seven of their last eight overall. TEMPE, Ariz. — In order to qualify for the NFL playoffs, the Cardinals must beat the 49ers on Sunday at University of Phoenix Stadium while the Buccaneers win in New Orleans. It’s that simple. Unfortunately for the Cardinals, they can only impact half of that equation. The other half is out of their hands, and that can weigh on a team’s mind. "Yeah, it does, but that’s on us," said receiver Larry Fitzgerald, recounting the opportunities the Cardinals blew earlier this season. "Having a 10-point lead going into the fourth quarter against St. Louis, letting the Philly game slip away. … We could easily be fighting for home-field advantage and a Week 1 bye. You’ve got to take care of business when you’ve got your opportunity." If the Cardinals do become just the second 11-5 team to miss the playoffs under the 12-team format, three close road losses in St. Louis, San Francisco and Philadelphia will gnaw at them all the more because this team is so hot right now that it feels it would be a Super Bowl threat following Sunday’s win in Seattle. I want to be 11-5 and let the chips fall. There is some joy in that, (but) if we’re watching the playoffs, we’ll be watching a bunch of teams we beat, and that’s a little bit sour. "It’s all about the ring," said coach Bruce Arians, whose team has won seven of its past eight games. "You play the game to get a ring, and you want to get in the dance. "I want to be 11-5 and let the chips fall. There is some joy in that, (but) if we’re watching the playoffs, we’ll be watching a bunch of teams we beat, and that’s a little bit sour." There will be plenty of scoreboard watching from the fan base and local media on Sunday since the Saints-Bucs game kicks off at the same time as the Cardinals-49ers game. But quarterback Carson Palmer said his team won’t get wrapped up in all of that. "It’s hard to not (do that), but you just can’t worry. You just can’t think about that stuff," Palmer said. In that regard, it helps that the Cardinals are playing a division foe and a team widely regarded as their fiercest rival. "We know they’re going into the playoffs, so we have a chance to send them into the playoffs with a loss," Palmer said. "That’s really the only focus we can have. We can’t worry about scores. We can’t worry about injury reports in New Orleans. You can’t be trying to find out what the score is. We just need to focus on the 49ers." If the Cardinals do win, they can accomplish a few milestones in the process. They can even their NFC West record at 3-3 after an 0-3 start in the league’s best division. They can establish a new franchise mark for home wins in a 16-game season (seven). They can tie the franchise record for wins in a season (11), last accomplished in 1975, and they can set a new benchmark for victories in the club’s Valley tenure (10 is the current high-water mark). But they’re not giving up on the bigger goal of the playoffs just yet. "Hopefully we do our part this upcoming weekend. It’s possible. I’ve seen crazier things happen," defensive end Calais Campbell said. "I could hang my hat on 11-5, but I would love to go to the playoffs." Offensive rankings: The 49ers are 24th overall at 320.3 yards per game (31st passing, 179.1 yards; 3rd rushing, 141.2 yards). The Cardinals are 21st overall at 337.3 yards per game (13th passing, 240.2 yards; 23rd rushing, 97.1 yards). Defensive rankings: The 49ers are 3rd overall at 305.9 yards per game (4th passing, 209.1 yards; 5th rushing, 96.8 yards). The Cardinals are 6th overall at 313.6 yards per game (15th passing, 229.1 yards; 1st rushing, 84.5 yards). The 49ers starters: San Francisco can still win the NFC West and the conference’s No.1 overall seed with a win and a Seattle loss at home to St. Louis. But if the Seahawks have their game comfortably in hand, don’t be surprised to see the Niners pull some of their starters to rest them for next week’s wild-card game. There isn’t much to gain for the 49ers on Sunday between the fifth and sixth seeds. Either way, they’ll be on the road for the first round, most likely in a cold-weather climate in Philadelphia, Green Bay, Chicago or Dallas, if the Cowboys can beat the Eagles and win the NFC East without QB Tony Romo. 49ers RB Frank Gore: San Francisco QB Colin Kaepernick has had some difficulties in his third pro season. He’s completing just 58.1 percent of his passes, which ranks 30th in the NFL, and his 19 TD passes rank 17th. That has meant a steadier diet of Gore, who is seventh in the NFL in rushing yards (1,114) and has nine TDs. Gore is the only back to top 100 yards against the Cardinals’ top-ranked rushing defense (101 on Oct. 13). Already the team’s all-time leading rusher, Gore is 100 yards away from his best rushing total since the 2006 campaign, when he rushed for 1,695 yards with eight touchdowns. He is also two scores away from surpassing his season high of 10 touchdowns set in 2009. He was limited in practice this week by a knee injury. Pro Bowl announcements coming: The Pro Bowl announcements will be made Friday at 7 p.m. Cornerback Patrick Peterson appears a lock for his third selection, while defensive end Calais Campbell could also be selected. Linebacker Karlos Dansby and special-teamer Justin Bethel have also had Pro Bowl-worthy seasons. — The Cardinals will wear their red-on-red uniform combinations Sunday. They are 14-3 in those uniforms and have won eight straight in them. 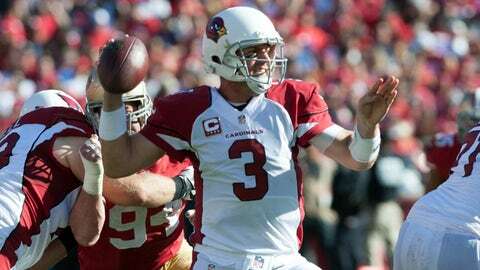 — QB Carson Palmer needs 133 passing yards to become the first QB in NFL history with 4,000-plus yards in a season for three teams. — The 49ers have beaten the Cardinals eight of the past nine times they’ve met by a combined score of 236-100. For the Cardinals, LB John Abraham (groin), G Daryn Colledge (back) and S Rashad Johnson (ankle) are questionable; LB Daryl Washington (ankle), DT Darnell Dockett (shoulder), TE Rob Housler (groin), RB Rashard Mendenhall (finger), QB Carson Palmer (elbow, ankle), T/G Nate Potter (ribs), LB Matt Shaughnessy (groin) and QB Drew Stanton (knee) are probable. For the 49ers, C Jonathan Goodwin (non-injury), LB Dan Skuta (foot), DT Justin Smith (shoulder), RB Frank Gore (knee), G Mike Iupati (knee), WR Mario Manningham (knee), TE Vance McDonald (ankle), WR Kassim Osgood (shin), LB Navorro Bowman (wrist), CB Tarell Brown (ribs), WR Michael Crabtree (wrist, ankle). The playoffs. The Cardinals need a win and a New Orleans loss at home to Tampa Bay (4-11) to secure the final NFC wild-card spot. That is the only remaining scenario in which they will make the playoffs. San Francisco can still win NFC West with a win and a Seattle loss, but the 49ers have already clinched a playoff spot. The Cardinals have everything to play for, while the 49ers may not if the Seahawks take control early against the Rams. Arizona knows its playoff hopes are slim but would love to finish the season on a high note and even its division record at 3-3 with a win over the only NFC West foe it has yet to beat this season. The Cardinals will be treating this like a playoff game.